Priest is a 2011 American horror film starring Paul Bettany as the title character. The film, directed by Scott Stewart, is based on the Korean comic of the same name. In an alternate world, humanity and vampires have warred for centuries. After the last Vampire War, the veteran Warrior Priest (Bettany) lives in obscurity with other humans inside one of the Church's walled cities. When the priest's niece (Lily Collins) is kidnapped by vampires, the priest breaks his vows to hunt them down. He is accompanied by the niece's boyfriend (Cam Gigandet), who is a wasteland sheriff, and a former Warrior Priestess (Maggie Q). The film first entered development in 2005, when Screen Gems bought the spec script by Cory Goodman. In 2006 Andrew Douglas was attached to direct and Gerard Butler was attached to star. They were eventually replaced by Stewart and Bettany in 2009 and filming started in Los Angeles, California, later in the year. The film changed release dates numerous times throughout 2010 and 2011. It was especially pushed back from 2010 to 2011 to convert the film from 2D to 3D. It is scheduled to be released first in the United Kingdom, Slovenia and Spain on May 06, 2011. 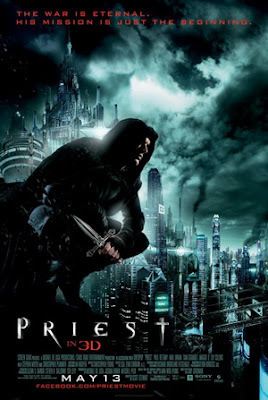 Priest is directed by Scott Stewart and written by Cory Goodman. The film is based on the Korean comics Priest by Min-Woo Hyung. The project was first announced in March 2005 when the studio Screen Gems bought Goodman's spec script. In January 2006, Andrew Douglas, who directed The Amityville Horror, was attached to direct Priest. In June 2006, actor Gerard Butler entered negotiations to star as the title character, and filming was scheduled to start in Mexico on October 1, 2006. By March 2009, Douglas was replaced by Stewart, who impressed Screen Gems with Legion. Paul Bettany replaced Butler in the starring role. Filming began in August 2009 in Los Angeles, California, and it concluded in November 2009.